The removal of tartar is done with an ultrasonic device which uses ultrasonic vibration and a streem of water. This treatment is short, painless and gives you the feeling of smooth, clean teeth. Why is it important to remove tartar? First of all, it is difficult to maintain oral hygiene with tartar on your teeth. Also, tartar puts pressure on your gums forcing them to recede which leads to bone damage. Gingivitis is gum inflammation caused by accumulated bacteria on dental plaque whish relese their endotoxins, exotoxins and enzymes. Although plaque is the main cause, gingivitis can be the result of allergy, hormonal imbalance and diet disorder or sistemic disease. Gingivitis goes through three phases. In phase one, which starts between the second and fourth day of plaque buildup, there sre pathohistological changes without showing any clinical signs yet. 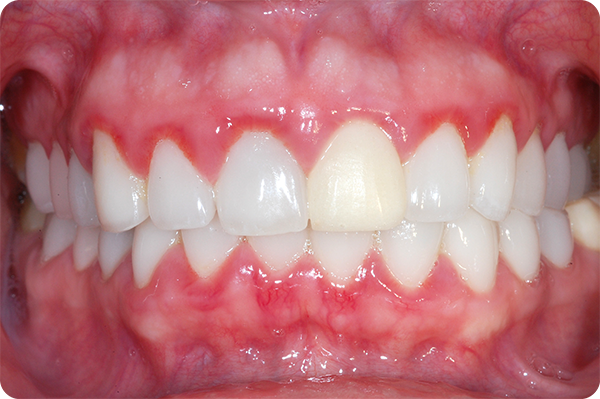 In pahase two, gums become red and prone to light bleeding when irritated. In the final stage, gums change their colour, shape, consistency, texture and start bleeding harder when irritated. In case of non-treatment, the inflammation will spread onto the alveolar bone causing paradontopathy. If treated on time the gums can recover. Treatment includes the elimination of local and systemic factors that have led to disease. Dental plaque is identified and then a patient is trained how to maintain oral hygiene. It is necessary to remove plaque and other layers which cause gingivitis. In some cases antibiotics are needed. Paradontopathy is the disease of supporting teeth structure which affects all periodontal tissues. Along with caries, this is the most common disease nowadays. The main cause is plaque followed by symptoms such as gum imflamation, receding gums, periodontal pockets, loose teeth and pathological teeth migration. A patient has the feeling of something tucked in-between their teeth, they notice bleeding when brushing teeth and complain about bad breath. Unless it is treated, paradontopathy can cause loose teeth, change in the passion of teeth and in the end the loss of healthy teeth (without caries or filling). 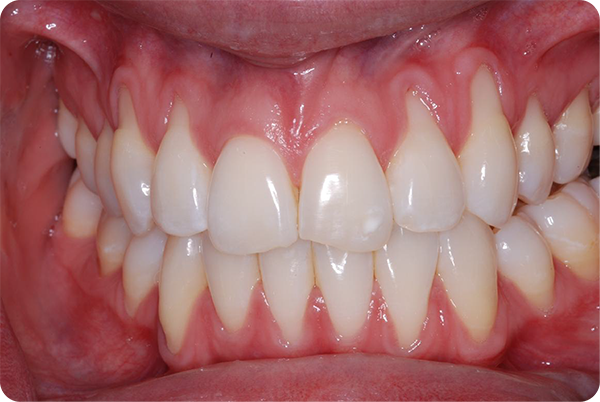 Treatment is planned according to the actual state of the teeth and supporting structure and is done in a few phases. This involves nonsurgical, and if needed surgical treatment. High level of oral hygiene is a must, which involves regular and correct teeth brushing, flossing, and using interdental brushes as well as antibacterial mouth rinse. In order to maintain the good state of your gum it is necessary to see a dentist every three to six months. Recession means that gums pull away leaving teeth necks and roots exposed. Thus the teeth become sensitive and they look bigger than those with healthy gum around. One of the causes of gingival recession can be occlusal trauma – when the relationship between the opposing teeth is incorrect. This can occure due to inadequate filling, inadequate prosthodontics, orthodontic anomalies or tooth loss, when the neighbouiring teeth lean towards empty space. Another cause can be high frenulum attachements and aggressive tooth brushing, which can cause the enamel to erode and gum to recede. Still, the most common factor is the tissue destruction as the consequence of paradontopathy. Treatment starts with proper oral hygiene, followed by removing of traumatic contact, replacement of inadequate prosthodontics and fillings, treatment of misaligned teeth, replacement of missing teeth, surgical treatment of high frenulums and treatment of paradontopathy. If desired results cannot be achieved with these methods, then surgery is the last step. In this procedure a flap is cut at the roof of the mouth and the tissue from under the flap is removed and stitched on the gum around the exposed tooth root. To prevent gum recession high level of oral hygiene is needed, which involves proper and regular brushing of teeth with soft-bristled toothbrush, using of interdental brushes and floss as well as antibacterial mouth rinse.